Aged garlic extract is, along with magnesium, the most prescribed supplement at our clinic. I have been using aged garlic extract for my children, for my patients and for myself, for over 25 years. Though I have worked with many different brands of supplements over the years, A.G.E. is the only one on which I have never waivered or changed my mind. Here’s why. Aged garlic extract is not your regular food or food supplement garlic. This unique garlic supplement has undergone significant chemical changes through a natural aging process that takes almost two years. A.G.E. is produced from American, organically grown garlic, which is aged in stainless steel tanks for up to 20 months. 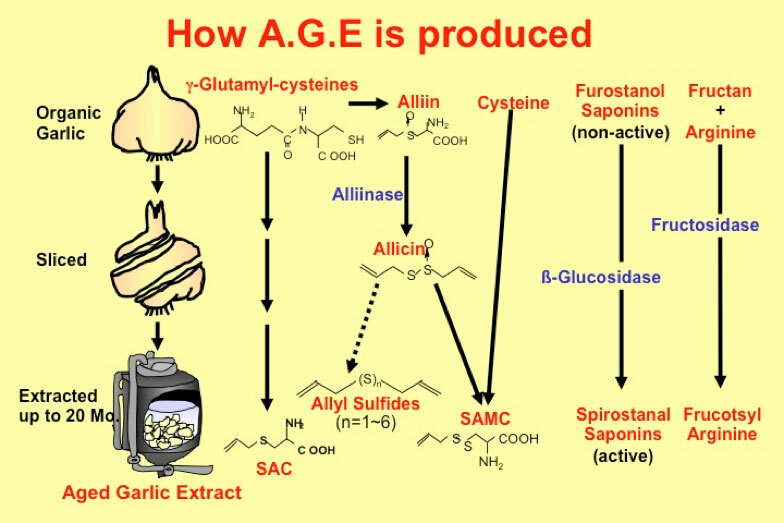 During the aging the natural enzymatic reactions transform the garlic into A.G.E. A little like the transformation of grapes to wine or milk to yogurt, though the analogy is far from perfect. During this aging process the harsh and irritating garlic compounds, including allicin1 , are converted into safe and beneficial ones. From social point of view, aged garlic extract doesa not have the pungent garlic after odor, which is why it is often referred to as “sociable garlic”. Mind you, I have absolutely nothing against garlic as a food. I am half Italian after all! However, the aging process does create an entirely novel type of supplement. The image below details some of the effects of the aging process. As mentioned earlier, A.G.E. has demonstrated a wide range of effects. Though I will not bore you with the 700 or so publications that highlight aged garlic’s effectiveness, I would like, to briefly mention some of its documented effects. Anticancer: I am referring here of course to the cancer preventative and protective effects2 3 , of A.G.E., not to its therapeutic effects. Physicians have used aged garlic extract as an adjunct to cancer therapy. A group of patients with inoperable cancers were given aged garlic extract for 6 months. Administration of aged garlic significantly improved their immune function4. Antioxidant: Aged garlic extract has exhibited important antioxidant activity5 6. One of the effects is due to the presence of S-allyl cysteine, an import precursor of glutathione7. The S-allyl cysteine in aged garlic extract has a 98% absorption rate8. Liver protectant: Aged garlic extract was found to protect liver cells from the toxicity of several drugs, including acetaminophen9 and methotrexate10. Cardiovascular health: You will remember that one of the most detrimental effects of stress is that it increases the risk of the metabolic syndrome. The symptoms of this syndrome being high blood pressure, high LDL cholesterol, low HDL, high triglycerides as well as elevated blood sugar. A.G.E. is an invaluable tool when it comes to addressing the metabolic syndrome, here’s why. Research on aged garlic extract has demonstrated its ability to normalize blood pressure in patients with bad uncontrolled hypertension12. Research undertaken by Dr. Matthew Budoff has demonstrated that A.G.E. helps reduce calcium buildup in the coronary artery, 13lowers inflammation of the arteries14, improves blood vessel function15, and decreases the amount of metabolically active fat tissue surrounding the heart. Many studies have also shown that aged garlic extract lowers LDL cholesterol and increases the good cholesterol16 in ways that are similar to those of statin drugs17 . Furthermore, in animal studies aged garlic extract was able to lower stress-induced blood sugar18 as well as reduce the complications of diabetes itself19. A.G.E. was also shown to reduce fatigue and increase vitality20, and interesting effect for those who are, or have been affected by stress21. In a clinical study in Japan, hospitalized patients showed improved stress symptoms related to their conditions, following intake of aged garlic extract as well as the B vitamins, B1 and B1222. 3 Tanaka S, Haruma K, Kunihiro M, et al. Effects of aged garlic extract (AGE) on colorectal adenomas: A double-blinded study. Hiroshima Journal of Medical Sciences 2004; 53(3–4):39–45. 4 Ishikawa H, Saeki T, Otani T, Suzuki T, Shimozuma K, Nishino H, Fukuda S, Morimoto Aged garlic extract prevents a decline of NK cell number and activity in patients with advanced cancer. J Nutr. 2006 Mar;136(3 Suppl):816S-820S. 11 Nantz MP, Rowe CA, Muller CE, Creasy RA, Stanilka JM, Percival SS., Supplementation with aged garlic extract improves both NK and ? ?-T cell function and reduces the severity of cold and flu symptoms: a randomized, double-blind, placebo-controlled nutrition intervention. Clin Nutr. 2012 Jun;31(3):337-44. 13 Budoff MJ, Ahmadi N, Gul KM, et al. Aged garlic extract supplemented with B vitamins, folic acid and L-arginine retards the progression of subclinical atherosclerosis: a randomized clinical trial. Preventive Medicine. 2009;49(2-3):101-7. 14 Zeb I, Ahmadi N, Nasir K, et al. Aged garlic extract and coenzyme Q10 have favorable effect on inflammatory markers and coronary atherosclerosis progression: A randomized clinical trial. Journal of Cardiovascular Disease Research. 2012;3(3):185-90. 16 Steiner M., Li, W. Aged garlic extract, a modulator of cardiovascular disease risk factors: a dose finding study of the effects of AGE on platelet function, J. Nutr, 131:980S-984S, 2001. 18 Kasuga S, Ushijima M, Morihara N, Itakura Y, Nakata Y. Effect of aged garlic extract (AGE) on hyperglycemia induced by immobilization stress in mice. Nihon Yakurigaku Zasshi. 1999 Sep;114(3):191-7. 19 Ahmed M. Antiglycation Properties of Aged Garlic Extract: Possible Role in Prevention of Diabetic Complications. J. Nutr. March 2006 vol. 136 no. 3 796S-799S. Aside from cardiovascular diseases, arthritis is probably the disease that affects the greatest number of people who have reached the golden age. In this article, I will focus on one particular type of arthritis, osteoarthritis, because it is, by far, the most frequent form, with a little over two million people in Quebec suffering from it. (27 million in the US). Balancing your acid/alkaline ratio is especially critical when you are challenged with the effects of stress. The following table provides a simple list of acid or alkaline forming foods. You can use this information to make the healthiest nutrition choices to support health and stress management.